Our product developers collaborate closely with paediatricians and medical experts throughout the entire development process – whether we are creating a completely new product or updating a classic. The input of medical specialists, such as paediatric orthopaedists and neonatal doctors, is very important when we design our baby carriers and other products intended for sensitive newborns and very young children. This means we always have expert approval for the various safety aspects of a product. This may include making sure that the design is correct for a baby’s hips, that a newborn baby has sufficient head support or that our user instructions are easy to understand. 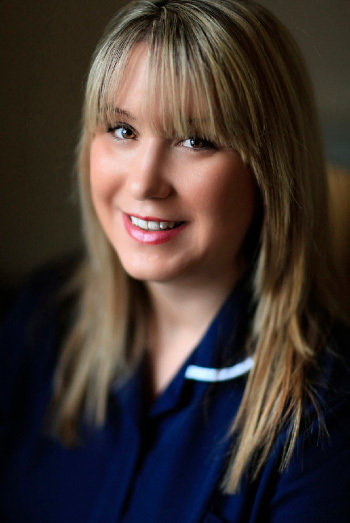 Katie Hilton is a midwife with many years’ experience of helping brand new parents. Yet in spite of all her experience, she still found becoming a parent an overwhelming experience. She says that the best advice she can give is to carry your little baby as much as you can. Holding your tiny newborn baby in your arms as they sleep peacefully against your chest is the best feeling in the world. In their first year, babies are totally dependent on their parents for safety and security; but there are other calls on your time. When you have older children who also need a lot of your attention, the situation may be even more challenging. A baby carrier keeps your hands free for other things while you enjoy the fantastic feeling of holding your baby close to your heart. The two most important things you can give your newborn baby are nourishment and physical contact. Closeness to the people who love you and take care of you is the best thing in the world. Researchers have observed that parents and children who stay in close contact with each other influence each other’s behaviour. If the baby frets, the parent immediately responds to their baby’s signals with soothing noises and movements, and quickly understands when it’s time to eat. Your baby hears your voice, feels your signals, and depends on you for safety and security. This interaction occurs automatically in your arms. Being carried in a baby carrier helps your baby’s emotional and social development. It also means that as a parent you can keep providing safety and closeness, even when you’re unable to give your baby your full attention. Babies who are frequently carried in a baby carrier tend to cry less. Carrying helps to meet your baby’s physical need for movement. In the womb, your baby grew accustomed to the rhythmic sound of Mum’s heartbeat and the feeling of being in a confined space. Your baby is soothed by gentle movements. A baby who is calm and contented makes Mum and Dad feel more confident, and vice versa. Many new parents also tell us their self-confidence has grown as a result of carrying their baby in a baby carrier. They have learnt to recognise their baby’s signals and respond to them before the situation escalates. A baby who is calm and contented makes Mum and Dad feel more confident and sure of themselves as parents. Mums who carry their baby in a baby carrier also frequently say they feel it has a positive effect on breastfeeding. They have rapidly learnt to recognise their baby’s hunger signals, breastfeed more frequently and find it easier. The closeness between mother and baby presumably stimulates milk production. Göran Kendorf evaluates buckles with Sofia, product developer at BabyBjörn, and six-month-old Naomi. He has been helping babies and young children for over 25 years. Göran has been involved in the development of our Baby Carrier One, travel cot and bouncer. The work of developing existing and new products is an ongoing process. Göran tells us that he is in the habit of studying the whole product, even if there has only been a slight change to a buckle. “Another thing I always check is that the child’s hips are in a good position in the baby carrier. The risk of hip dysplasia or hip dislocation disappears once the baby is a few months old. Provided the baby doesn’t have a congenital condition, that is,” Göran explains. Should parents be worried about their baby’s hips when they use a baby carrier with a narrower seat area, such as our classic Baby Carrier Original? 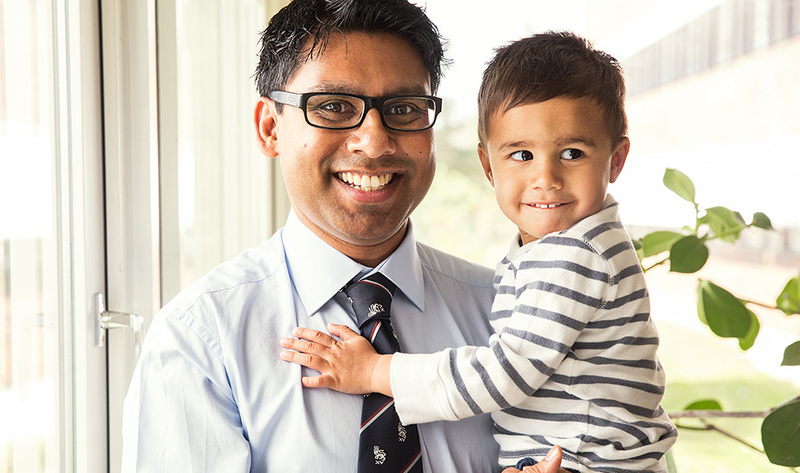 Nicholas Hoque is a paediatrician at a neonatal intensive-care unit in London. In his work, he meets many premature babies and he is an ardent advocate for closeness and physical contact between parents and babies. We were contacted by Nicholas and were so impressed by his expertise that we asked him to be one of our development department’s medical advisors. “At work, I’m always advising new parents about the benefits of maintaining close physical contact as much and as frequently as possible. This advice is backed up by numerous scientific studies, particularly in regard of the all-important baby attachment. “My job involves treating children with hip dysplasia and I know there’s no evidence that modern baby carriers cause this serious problem. “We had such a wonderful experience when I carried Barnaby in a baby carrier in New York that I wrote to BabyBjörn afterwards to thank them. They got in touch and I’m now providing them with my medical expertise,” reports Nicholas Hoque.